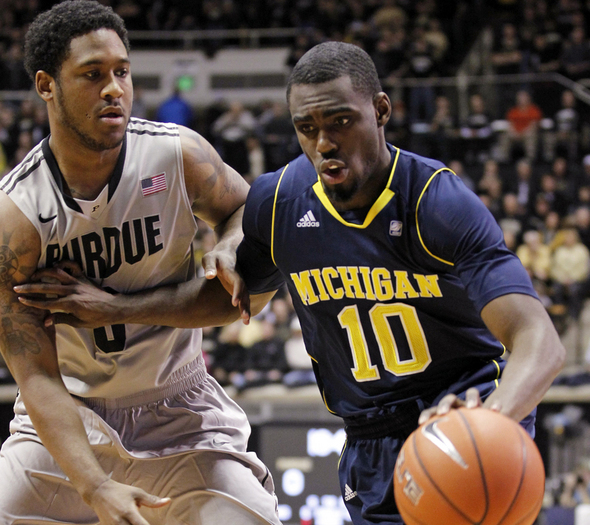 Posted on Tue, Jan 24, 2012 : 9:12 p.m.
Michigan guard Tim Hardaway Jr. drives on Purdue guard Terone Johnson in the first half of the Wolverines' 66-64 win in West Lafayette, Ind., on Tuesday. Hardaway scored a game-high 19 points. WEST LAFAYETTE, Ind. -- The whiteboard inside the Michigan basketball locker room at Mackey Arena featured a message the club hasn't seen in some time. The 20th-ranked Wolverines team blew a double-digit, second-half lead on the road at Purdue on Tuesday, but a pair of late-game stops proved to be enough as the Wolverines earned their first road win of the season with a 66-64 victory over the Boilermakers. "I joked around with (freshman point guard Trey Burke) about the road stuff before the game, I said 'you're a great player, but you can't win on the road, when's that going to change?'" Michigan senior captain Zack Novak said afterward. "(The road struggles) wasn't something that was weighing on us. "But it feels good to get one." Michigan had lost all four of its previous road contests, and entered the game as the lone remaining member of The Associated Press' Top 25 without a road victory. Finally. For the first time this season, Michigan (16-5, 6-2) left an opponent's gym with a smile on its face. The Wolverines nearly blew a 10-point second-half lead, but an extended defensive stop in the game's final minute and an extra free throw from Evan Smotrycz proved to be enough. It was also the first time Michigan had won at Purdue since 2003. The victory moves Michigan to 6-2 in the Big Ten, and will keep the Wolverines at least tied for first place leading into a game Sunday at Ohio State. If the Buckeyes (17-3, 5-2) can get by Penn State on Wednesday, Sunday will be a battle of first-place teams. The game will tip at 1 p.m. and air nationally on CBS. Tim Hardaway Jr. has had his share of road struggles all season, and the Wolverines suffered because of it. He made up for some lost time on Tuesday. The 6-foot-6 sophomore forward snapped out of a recent funk with a game-high 19 points on 8-of-15 shooting. He also secured what ended up being the game-winning rebound with just nine seconds to play. "I joked around with (freshman point guard Trey Burke) about the road stuff before the game, I said 'you're a great player, but you can't win on the road, when's that going to change?' (The road struggles) wasn't something that was weighing on us. But it feels good to get one." With the win, the Wolverines (16-5, 6-2 Big Ten) stay in first place in the Big Ten standings. It was also Michigan's first win in West Lafayette since 2003, snapping a six-game losing streak. "Only the great, great teams can win on the road continually," Michigan coach John Beilein said. "We weren't a great team (tonight), this wasn't a huge upset and we're not this team that has so much talent that we can win and play poorly. "The ball bounced our way, and it wasn't about a mindset or anything. Our mindset's been the same (at home and on the road), we're just learning all the time." Sophomore forward Tim Hardaway Jr. paced four Wolverines in double figures with 19 points, while both Jordan Morgan and Stu Douglass finished with 12. Evan Smotrycz found his way out of a recent funk, dropping in 10 points off the bench. Burke, meanwhile, finished with just six points on 3-for-10 shooting but was able to hand out six assists. Purdue (14-7, 4-4 Big Ten) was led by Lewis Jackson's 17 points and Robbie Hummel's 16 points. "We need to do a better job of starting games," Purdue coach Matt Painter said. "We're a slow-starting team and hopefully we can correct that." The Wolverines led by as many as nine points during the first half, and for the first time this season, took a lead into halftime of a road game, up 30-28. As it did during the opening minutes of the game, Michigan exerted its will early in the second half, as well, holding the Boilermakers without a field goal for more than six minutes and using some hot shooting from Hardaway to snap off a 9-1 run, making it 41-31 with 16:34 left. Purdue didn't roll over, though. Jackson ended a 7-1 Purdue run with a jumper, cutting Michigan's lead to four. And two minutes later, Jackson's athletic three-point play ended another Boilermaker run, this time 8-0, giving Purdue its first lead since the game's opening minutes at 49-47 with 9:11 remaining. Purdue made it 10 straight on its next trip after a jumper from Hummel, capping an extended 17-3 run. "On the road, we'd normally be down and the crowd would be into it because we were up the entire time," Hardaway said. "And then we'd come back, but tonight was different. We were just thinking about the home games, Northwestern, Minnesota, and any game where a team came back and took the lead on us. "We were just trying to go back home with a 'W.'" Michigan stopped the bleeding two possessions later when Morgan dropped in the Wolverines' first points in more than four minutes before Douglass gave Michigan the lead back with a 3-pointer from the corner. The lead didn't last long, though, as Purdue got a triple from D.J. Byrd its next trip down the floor, and then a running layup from Jackson to go back up four with 5:33 to play. The game flowed back and forth from there, with both teams claiming leads over the next five minutes and the Wolverines clinging to a 65-64 edge with just 40.1 seconds to play. The Boilermakers had two cracks at a game-winner, but both Hummel and Ryne Smith missed 3-pointers, giving Michigan the ball back up one point with 9.5 seconds to go. Smotrycz then split a pair of foul shots with 3.8 seconds to play, and Jackson was too strong on a desperate last-second heave -- giving Michigan its first road victory of the 2011-12 season. Michigan has its first taste of victory on an opponent's floor, but it won't get any easier. The Wolverines will travel to No. 4 Ohio State on Sunday, and after a home game against Indiana on Feb. 1, the Wolverines head up the road to East Lansing on Super Bowl Sunday. Should the Buckeyes (17-3, 5-2) beat Penn State on Wednesday, the game in Columbus on Sunday will feature a pair of first-place Big Ten teams. But, for one night, Michigan was content enjoying this one. And having a happy flight home for a change. "With the way our schedule is, this was a game, regardless of where we were at, we had to win," Novak said. "We gutted it out and that's a good team we just played. Wed, Jan 25, 2012 : 4:54 p.m. Wed, Jan 25, 2012 : 3:38 p.m. While it may be short-lived, I am going to sit here and enjoy having the Wolverines in 1st place, well into the season. When's the last time that happened??? Wed, Jan 25, 2012 : 2:33 p.m. Wed, Jan 25, 2012 : 1:05 p.m. Wed, Jan 25, 2012 : 4:33 p.m.
Good question. I think he was resting him so he could finish out the game with ENERGY! As he did. As soon as he came back in there was a 5 point swing in about 30 seconds. Awesome stuff. Wed, Jan 25, 2012 : 12:50 p.m.
Nice road win, they needed it. Go Blue! Wed, Jan 25, 2012 : 2:53 a.m.
Take that, Nick! Tell us about our crapy road game now, dude! Solid win. Please remember that a couple foul calls and individual shots would have given us two more wins on the road thus far, too. Now let's just see how we play in the next road affair... perhaps a bit more challenging. Jordan Morgan is playing the best ball of his life right now. Would love to see a duo with Hortford though, come on Johnny, let's test that foot already.